You asked for it, you got it. This spring, North America's premier open-wheel racing championship is finally coming to COTA's hallowed Stars and Stripes to write the first chapter in a brand new racing legend. International rock superstars MUSE join the party Saturday night, bringing their electrifying live show to Austin's big INDYCAR debut. Tickets are available now at http://circuitoftheamericas.com/indycar and will be available during race week at the Grand Plaza Box Office. The event schedule is available at http://bit.ly/IndyCarClassicSched and within the COTA app. WHAT OTHER SERIES ARE RACING? INDYCAR will be joined on track by Indy Lights, Mazda MX-5 Cup, and Stadium Super Trucks. Yes! Please note that all holders of a paddock pass will also need a race ticket to access Circuit of The Americas. The paddock pass itself is not a valid race admission. HOW CAN I SEE MUSE SATURDAY NIGHT? Muse's performance takes place at Austin360 Amphitheater in the heart of COTA's Grand Plaza. Any guest with valid Saturday admission will receive access to the H-E-B Lawn and 200 Level seating for the concert. The H-E-B Lawn and seating in the 200 section are entirely general admission, first come, first served. IS IT A FULL SHOW OR JUST A FEW SONGS? Prepare for hysteria. It's a full show. I'VE GOT TO BE UP CLOSE FOR THAT. ARE THERE CONCERT UPGRADES? There sure are. Concert upgrades are an optional add-on to your IndyCar Classic ticket which will get you closer to the action. Upgrades are available in the 100 Level of seats and the Pit (standing room only). They are available during checkout or by phone at 512-655-6300. 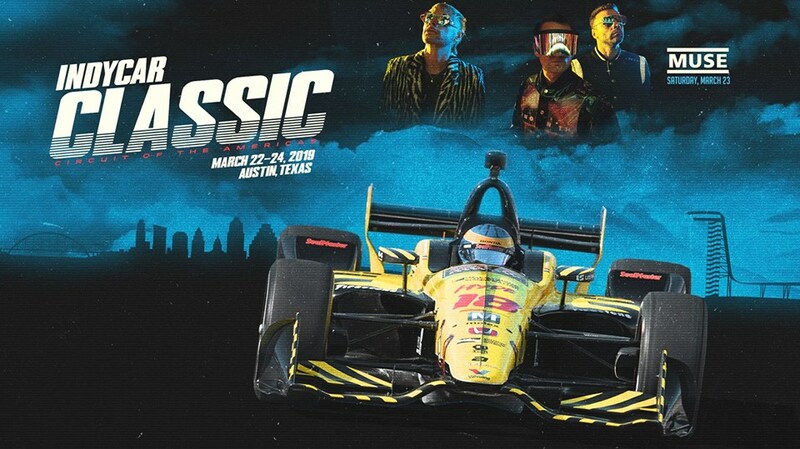 Please note that all holders of a upgrade will also need an IndyCar Classic ticket (3-day or Saturday-only) to access Circuit of The Americas and Austin360 Amphitheater for the concert. Absolutely. Review the COTA ADA policy at circuitoftheamericas.com/ada-accessibility, including instructions for purchasing ADA accessible tickets through Ticketmaster.